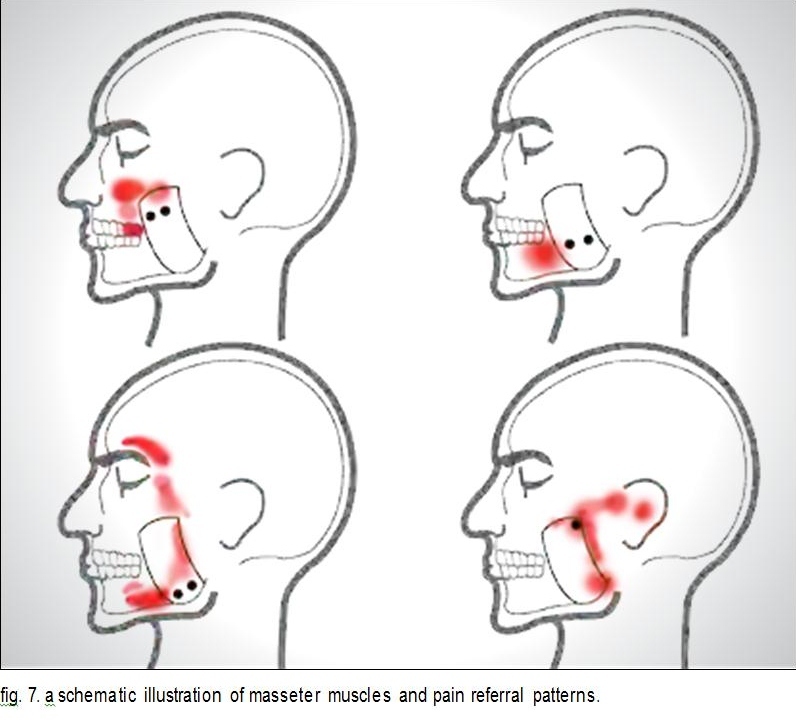 Myofascial pain - What is this orofacial pain? How fixed? This is the sixth in a series of 7 posts about orofacial pain with difficult to diagnosis or unusual origin. This pain goes hand in hand with the previous referred pain and in most dental cases is caused by the same thing. It is pain coming from one or more overworked muscle groups in the facial region and accompanied by both local and referred pain. There will be a knot(s) in the muscle and an identifiable trigger point (TP). Dr. Rich Hirschinger has a great website that explains some of this. The trigger point is an area that is excessively sensitive to pressure. If the TP is very hypersensitive a referred pain will occur. If palpated there may be a twitch and a report of pain in the referred pain sight. This pain is more of a dull ache and can come and go depending on how overworked the muscle is. 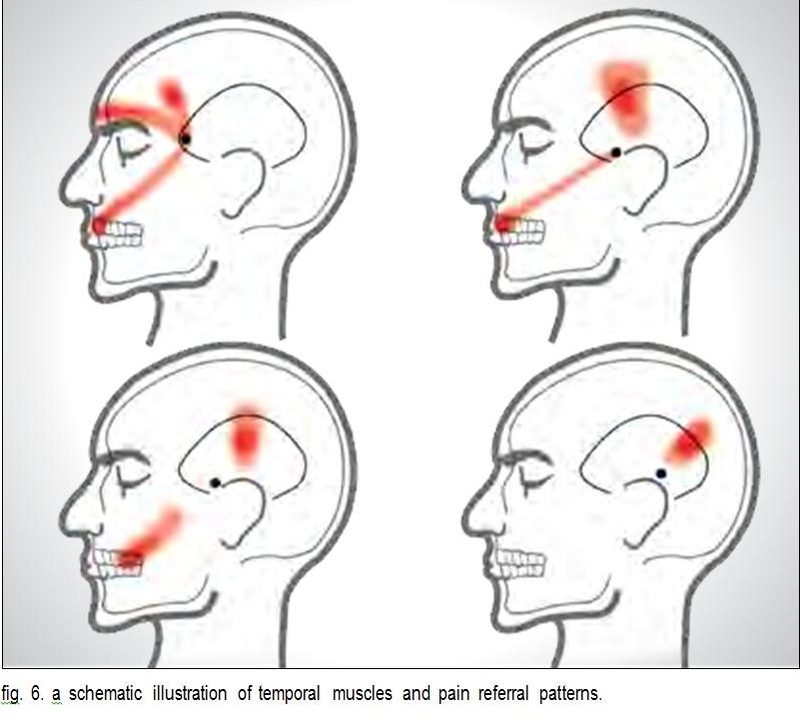 The location of the TP will determine where the patient typically “feels” the pain. Again, this is an excellent article on how to palpate the muscles and where the referred pain tends to be for each muscle. Palpation of the muscles and a little knowledge about where certain muscle’s trigger points are will result in referred pain, which allows for the identification of the sore muscle. This can be confirmed with injection of anesthetic without epinephrine or a spray-and-stretch procedure at the TP. Once located treatment is the same as for that recommended in referred pain and on the acute TMD blog. Myofascial pain is usually a somewhat continually recurring condition and a nightguard of some sort may be helpful. The best “fix” is Botox. Our own Dr. Danielle, an orthodontics and dentofacial orthopedics specialist, uses Botox in some cases with a lot of success. For more on chronic pain check out my TMD and chronic pain blog. Very rare but want to rule out temporal arteritis since left untreated can lead to blindness in affected side. Difference is will have a burning pain feeling in addition to classic myofascial pain symptoms.